The SoftPerfect Connection Emulator (SCE) software is aimed for network application developers, system administrators and IT professionals. Software developers creating network-enabled applications, especially those time-critical such as VoIP software or real time protocols, need to test their products thoroughly in a range of environments. Apparently most applications work well on broadband connections, but what if you need to test your application on a low-speed communication link such as GPRS or Satellite? This is where SCE comes in handy. It imitates a network connection with a low bandwidth limit, delays, losses and other problems. Using SCE you can test how well your application performs on a slow or long distance connection to ensure the quality of the product being developed. SCE runs on any PC with Windows XP or higher, allowing you to selectively apply bandwidth limits and simulate packet traversal issues to mimic a low-grade communication channel. This product is available as an unlimited duration trial, however maximum simulation session is limited to 30 seconds. Purchasing a licence will remove this limitation and allow to run lengthy simulations. We also appreciate any feedback on this product to make sure it meets your needs. Runs on any PC with Windows XP or higher (32-bit and 64-bit). Applies fixed or variable latency. Load Profile reads the configuration from an XML file previously created with the Save Profile command. The profiles are useful if you have got multiple simulation configurations each having specific settings. The Setup Filter button opens filter configuration. 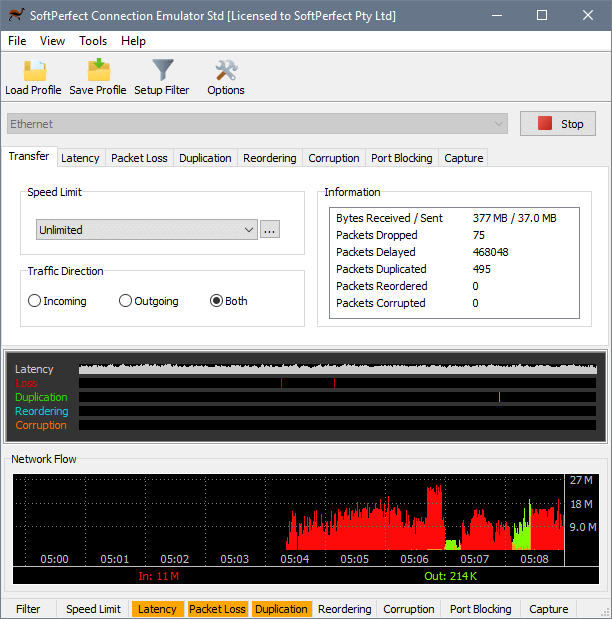 Unless you define a filter, the speed limit and other simulation settings apply to all packets traveling through the selected network connection. 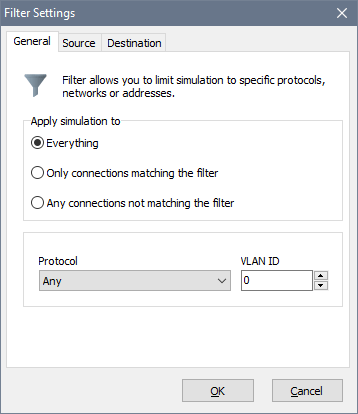 The filter allows you to apply the simulation settings to one or more IP connections, while letting all other traffic flow unrestrictedly. The Options button provides access to several user preferences that you may want to adjust. On the Transfer Rate tab you can specify a speed limit choosing among a few predefined items or define your own. A Traffic Direction, i.e. incoming or outgoing traffic flow that simulation affects can also be set here. When using variable latency, you can also specify correlation. 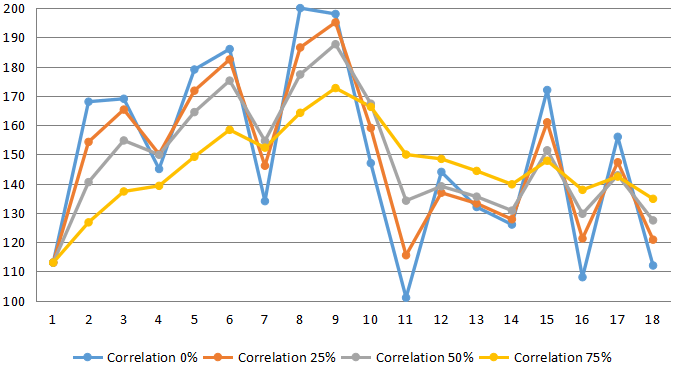 Correlation indicates how much each current value depends on the previous one, making the sequence of values less random. This chart demonstrates the effect of correlation on random latency between 100ms and 200ms. 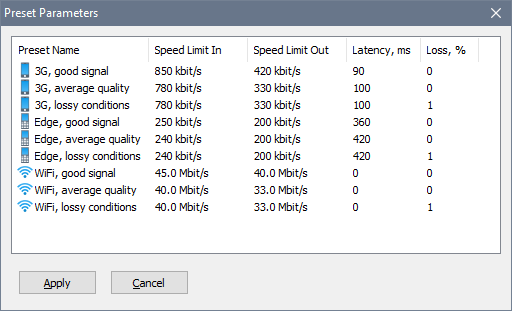 On the Packet Loss tab you can specify the percentage or number of packets that should be lost in transit. These packets are dropped upon receiving or sending out. 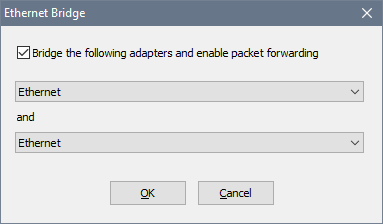 The emulator will take a packet out of the flow, then normally pass the number of packets specified as the Gap, and then insert the packet previously taken out. For example, if the gap is set to 2, the flow consists of packets A, B, C, D, E and F, and packet B was chosen as a victim, they would arrive in this order: A, C, D, B, E, F.
On the Corruption tab you can specify what packets will be corrupted. The software flips a random bit in a packet to simulate a transmission error or a faulty network device. Percentage of packets mode has victim packets chosen randomly within the specified probability. Bit error rate (BER) is the number of bit errors per unit of time; for example, 2 corrupted bits per minute. Bit error ratio (BER) is the number of bit errors divided by the total number of transferred bits. For example, a ratio of 10e-7 or 0.000001 means 1 bit in 1 000 000 is corrupted. 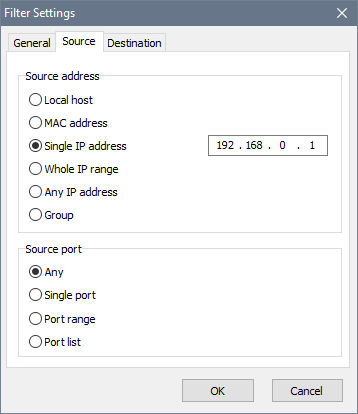 On the Port Blocking tab you can list individual ports or port ranges, packets to and from which should be dropped. To specify a protocol, prepend the port number with the letter T for TCP or U for UDP. If there is no prefix, both TCP and UDP will be dropped. This allows you to simulate a firewall or the situation where an ISP filters incoming packets. The emulator features a live chart displaying manipulations performed on each packet. Each tick represents one packet that had latency, loss, duplication, reordering or corruption applied to it. Latency chart shows delays in proportion to each other: longer vertical lines represent longer delays. When an emulation session is in progress, SCE will be forwarding all packets arriving to the first NIC to the second NIC and vice versa. The bridge itself will be able to communicate with either side, provided its IP configuration is correct. If SCE is launched with a XML-file specified, it will load the specified configuration profile and begin emulation automatically. If emulation is already running, it will load the specified file and continue with the new parameters. If the /runtime switch followed by a number of seconds is present, emulation will run for the specified number of seconds and then the application will terminate. To terminate emulation immediately, specify /quit to close the running instance.